This site is a work in progress and I am constantly trying to update and improve. We live in a community rich in history. We celebrate each May our dutch heritage with a "Tulip Festival". My grandparents and great grandparents immigrated from Holland. Our kennel name is "Little Dutch" because I am of Dutch descent and we live in a small community. 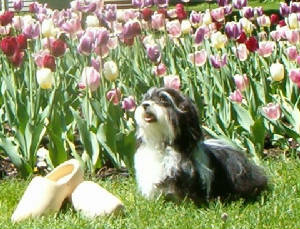 This is Joey pictured with wooden shoes and tulips in spring!